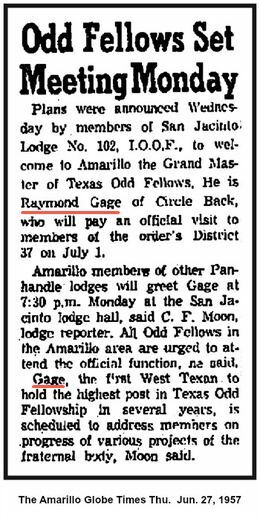 Raymond Paul Gage and Thelma Mae Terrill were married August 24, 1930, in Shamrock, Texas. In early 1931 they built a gin and moved to Flat, Texas, but they only stayed there a few months, then moved the gin on to Circle Back. When they moved to Circle Back, they lived in a tent for the first months, until they built them a home. Thelma went back to Shamrock to have their first son, Skinny. The rest of their children, Mary Lorice, Bob, Gereta Marie, and Raymond, Jr., were all born at Circle Back. Raymond and Thelma lived on the gin yard as did Elmer and Alta, Less and Letha. Raymond built a shop on the far south side of the gin lot, and worked on cars, trucks, and tractors during summer months. In the fall they all worked at the gin, as well as half the farmers in the community. Some of them were: Jack Harper kept books for years, L. A. Harper, Robert Taylor, Pal Legg, Richard Turner, Billy Gore, Loyd, Boyd, and Donald Gilreath, Claude Patton, Floyd Damron, Walter Damron, and many more. 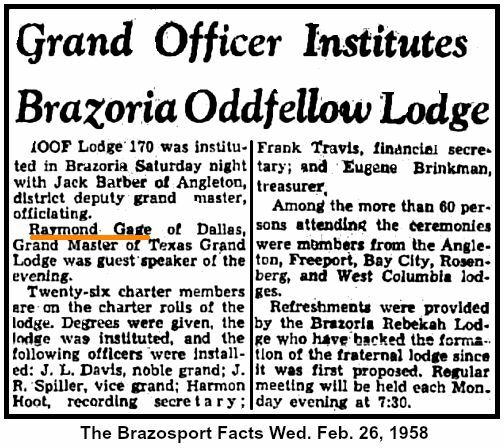 Raymond was a very gifted man. He did all his gin repairs himself, all his wiring, and did a lot work on his and friends' appliances. He dearly loved to work, and was always thrilled when anyone needed his help. He always whistled the same little tune, that he had made up, while he worked. 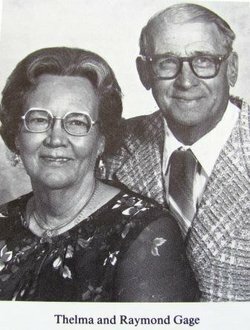 Raymond and Thelma lived and worked in the little community. Their greatest love was the Circle Back Baptist Church where Raymond was a deacon for 35 years. 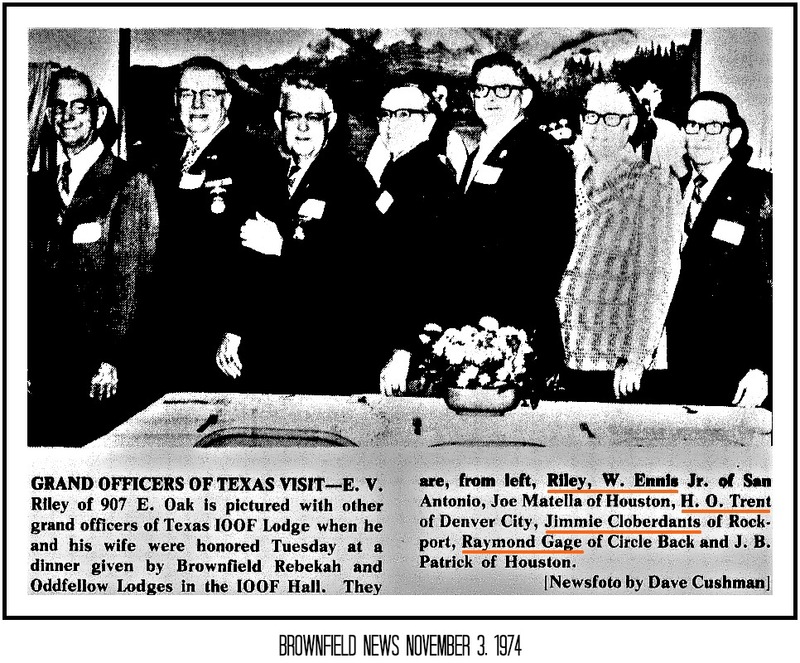 Raymond served on the school board at Circle Back and Sudan on the Five Area Telephone Board, the South Plains Hospital Board. 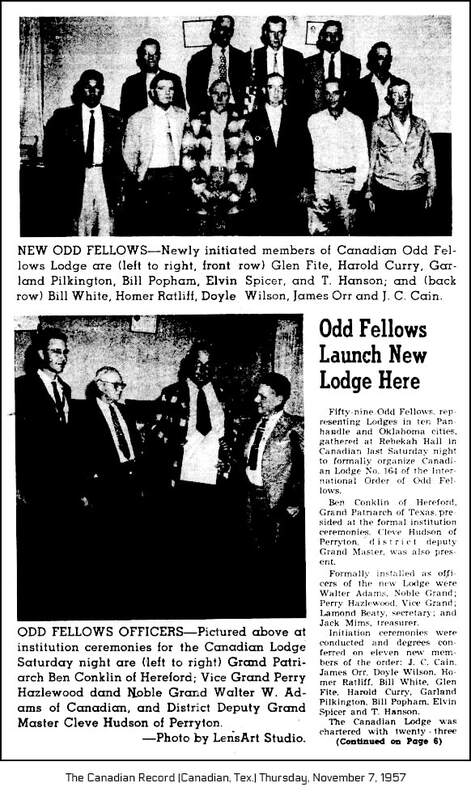 He was grand master of the IOOF Lodge, grand representative of lodge for 20 years. Thelma was also very active in church, school, lodge, scouts, singing, and all community things. 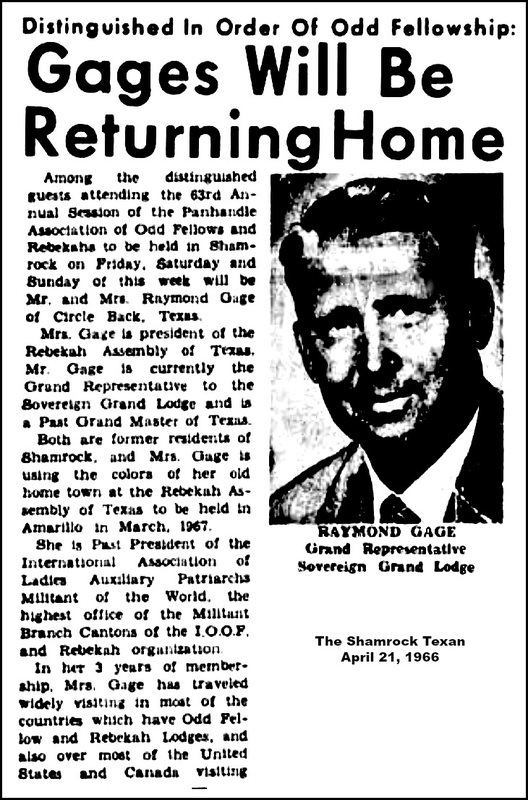 She was president of Rebekah Assembly of Texas, 1967 and 1968, also president of Ladies Auxiliary Patriarch of the World 1958-1959. Thelma's mother Angie Terrill came to live with them about 1946 until she died in 1962. 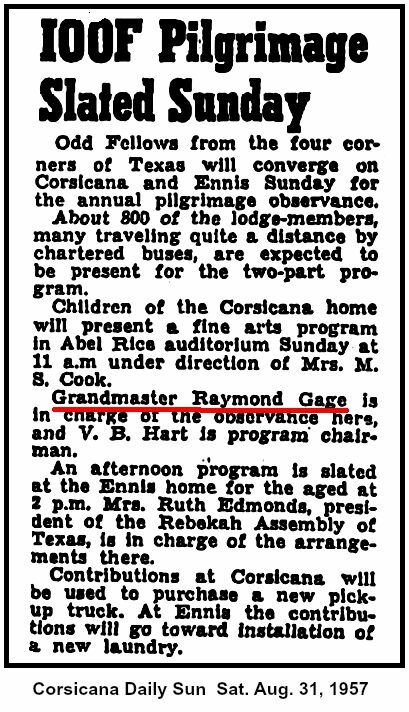 In 1946 Raymond bought the gin, "The E. G. Gage and Sons Gin" became the Raymond Gage Gin. Raymond operated the gin until he sold it to Ross Lumsden. After the children were all grown, Raymond and Thelma began to travel in the summers a lot. They have been to all 50 states, traveled nearly all of Old Mexico, in the early 50's they went to Cuba and Hawaii, they traveled nearly all of Canada. They toured Europe in the early 60's, Ireland, England, France, Italy, Spain, and Portugal. On most of their trips they traveled with friends. They loved people and loved to be with people, friends and loved ones. In October 1977 they bought a home and moved to Sudan. Raymond was sick that fall and didn't get to go to the gin much, so he sold the gin in the spring of 1978. They then became very active in working with the Senior Citizens. 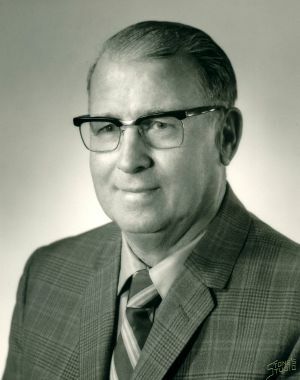 Raymond was voted "Senior Citizen of the Year" in 1983. He was given this reward at a rally in Lubbock.